1st Place! Illustration by Naters Calderone. Wow, you guys really channeled your inner Jedis for our Star Wars art contest! You redesigned the characters in so many fun ways, from members of a mariachi band to the cast of Seinfeld. Thanks to everyone who took part!! Per Jake Parker, who judged the contest this time, "You creative people have done some amazing work! Made it really hard to pick a winner." Concept - Is the idea creative or unexpected in an intriguing way? Design - How has the artist used proportion, repetition, balance, and contrast to create something unique, compelling, or beautiful? Structure - Are the shapes and forms solidly built? Rendering - Whether it's in color, black & white, or just line-work, what is the quality of the craftsmanship in the execution of the artists vision? 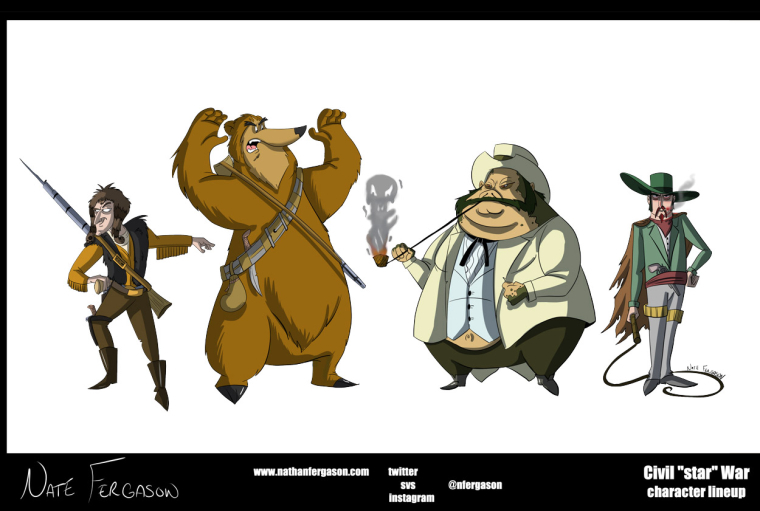 Hats off to Naters Calderone, who reimagined the crew as old-timey cartoon characters. Per Jake: "I felt like it was a brilliant move to place something edgy and sci-fi within the context of something as gushy and approachable as the rubber hose animation style from the 20s and 30s. (Example here) So points awarded for concept. The design, structure and rendering on this is all solid as well. You got the style down, but you also brought a little something of your own to it. So great job!" Second place went to Hannah England, who turned the characters into pooches. Here's Jake again: "Hannah wasn't the only one to turn star wars characters into animals, or dogs for that matter. But I like her concept the best. She stuck with droids, and since droids are mostly companions to humanoids in Star Wars she likened them to dogs. Nice move. Not only that, she picked dogs that best matched each droids personality or temperament. Lastly, it's just executed so darn well. Nice rendering, structure, and design. Good job Hannah!" 2nd runner up! Illustration by Hannah England. Jake also ended up picking 8 more entries as honorable mentions. Check 'em out (with Jake's comments) below! "Ha! Pretty funny. Nice idea Jason. Points for concept, but felt like the rendering and structure were lacking." "These look like they could be characters in the Star Wars Rebels series. I like where it's going, but the togrutian looking female looks so much like Ashoka that I couldn't see what you really brought to the character. I love the droid though!" "Really well drawn and rendered. Great concept too!" "I'm a sucker for Labyrinth. Had to spotlight this. Great idea, and really nice character designs. Watercolors got a little dull though. Could've used Photoshop to punch things up more." "Creative idea. Love the puns." "Another great idea, and utterly unique direction to go. Character designs got a little flat. But there's a lot of potential here. Would love to read a fan-fic of this." "More dogs! I love them. Amazing rendering on these guys." "Dude, creepy! Such a neat take on star wars. And the black and white just adds to the mystery of these designs." Newer PostDecember 3rd Thursday is up! Older PostNew video with illustrator Anna Daviscourt coming soon!